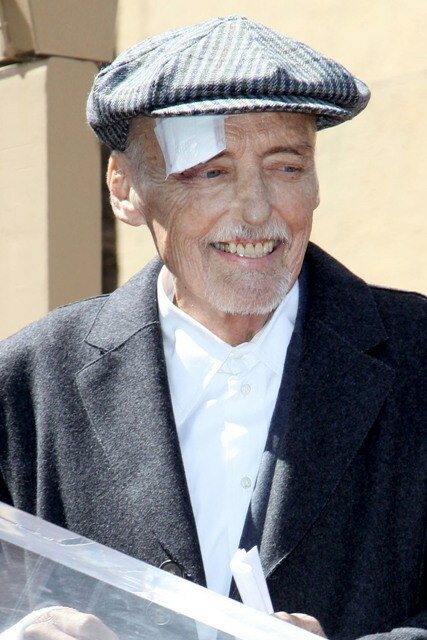 In what could well be his last official public appearance, a decidedly gaunt looking Dennis Hopper received his star on the Hollywood Walk of Fame Friday in Los Angeles. By his side during the induction ceremony were his 7-year-old daughter Galen Grier Hopper and actor Jack Nicholson. I had no idea that he was so far off now 🙁 my god, I think I just watched a movie with him in it. via Dennis Hopper got a star on the Hollywood Walk of Fame. I knew he was very sick, but was also surprised at how weak and small he looks. I saw the video and he’s barely moving. It was sad. That’s a lot of lost weight. Yeah, the coat shows it, but you have to really look. But for God’s sake! don’t button the top button when the collar is at least three inches too big! Unless the top of your chest is that hideous!